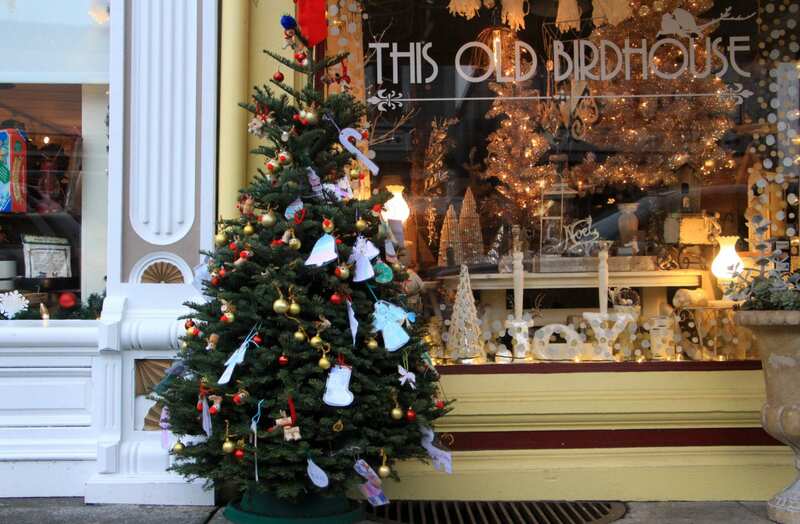 Visiting Ferndale during the holidays is like stepping into an old-fashioned Christmas card. 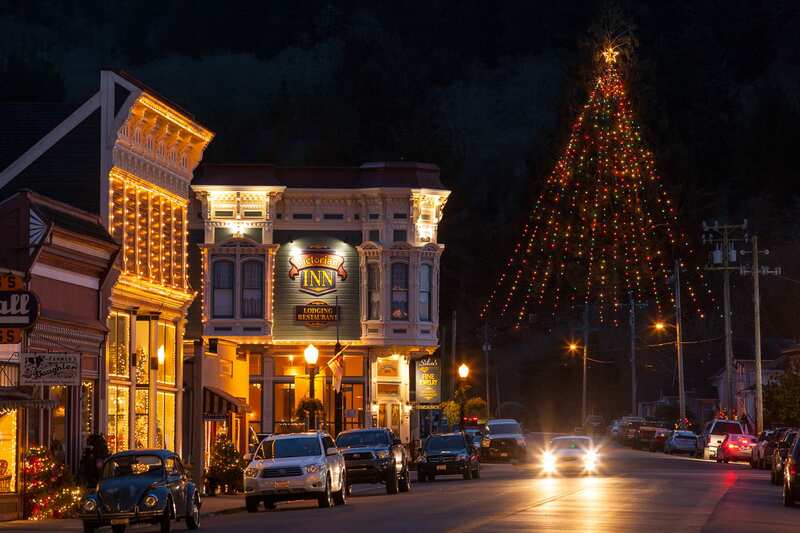 Nestled amid bucolic farms on California’s Redwood Coast, the Victorian storefronts lining Main Street glow with twinkling lights. Lamp posts are wrapped in garland and topped with red ribbon bows. Shop windows sparkle with festive displays, and a Christmas tree stands outside each store. At the end of the street, America’s tallest living Christmas tree towers over the scene. Ferndale’s volunteer firefighters have been lighting the tree every year since 1934. Held the first Sunday in December, the annual tree lighting draws the whole town to the end of Main Street to sing carols and share hot cocoa and treats. As I wandered through downtown Ferndale last week, the town was brimming with the holiday spirit. I encountered gaggles of school children decorating the trees outside the shops with ornaments they had made in class. Street crews were trimming lamp posts with garland, and shopkeepers were busy sprucing up for a block party to kick-off the holiday season. Every Friday in December until Christmas, merchants stay open late for holiday shoppers and spice up the evenings with live music, costumes, and activities. Despite the town’s small size, the mom-and-pop shops abound in one-of-a-kind gifts to fulfill any wish list. On December 16th, the annual Lighted Tractor Parade will roll through Main Street, and now through December 16th, the Ferndale Rep is staging performances of “A Christmas Story, the Musical.” For more nostalgic winter fun, there’s also an ice skating rink at the Humboldt County Fairgrounds, less than a mile from downtown. 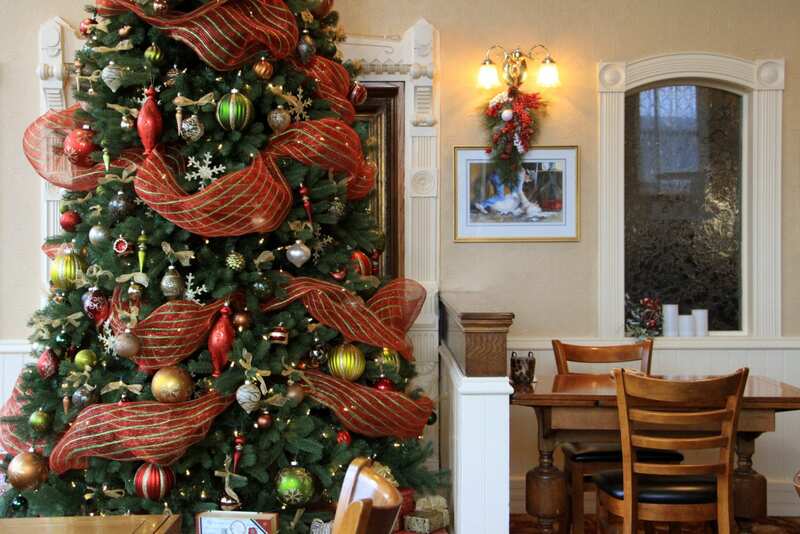 Two historic inns in downtown Ferndale are decked out for the season in all their holiday finery. 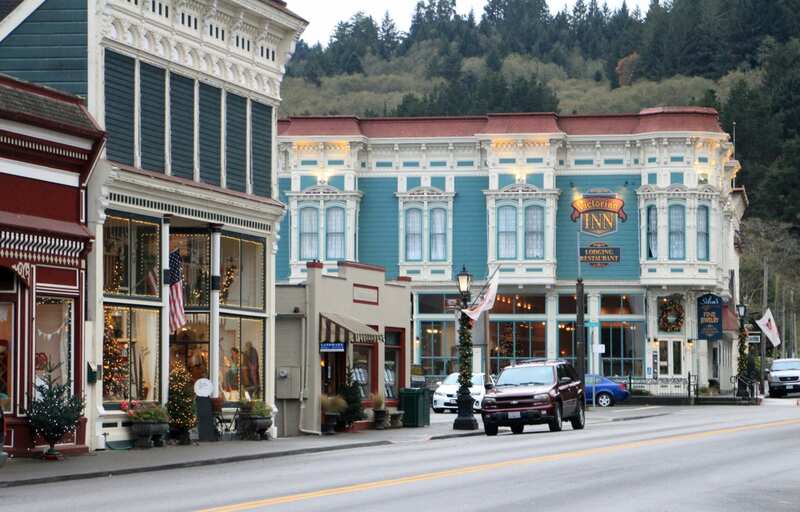 They provide plush accommodations for exploring town, the redwood coast, and settling in for a long winter’s nap. 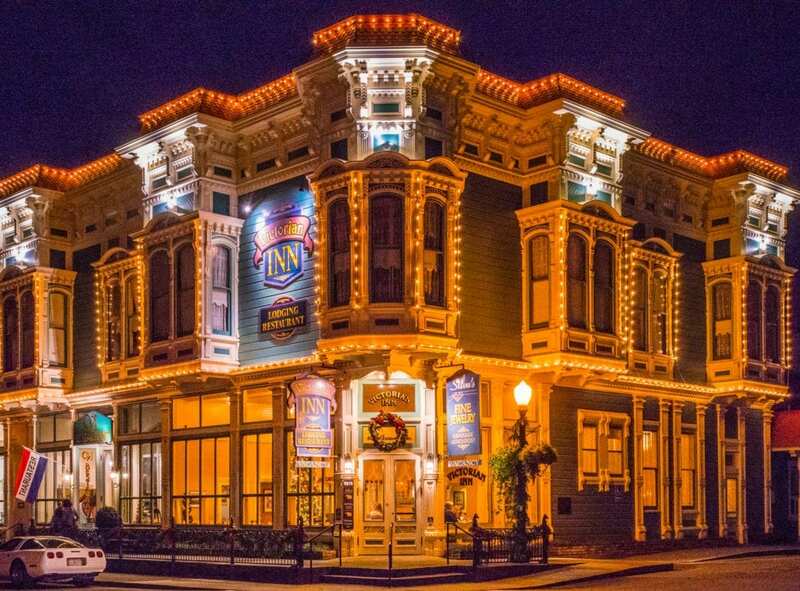 At the top of Main Street, the grand Victorian Inn was built in 1890. 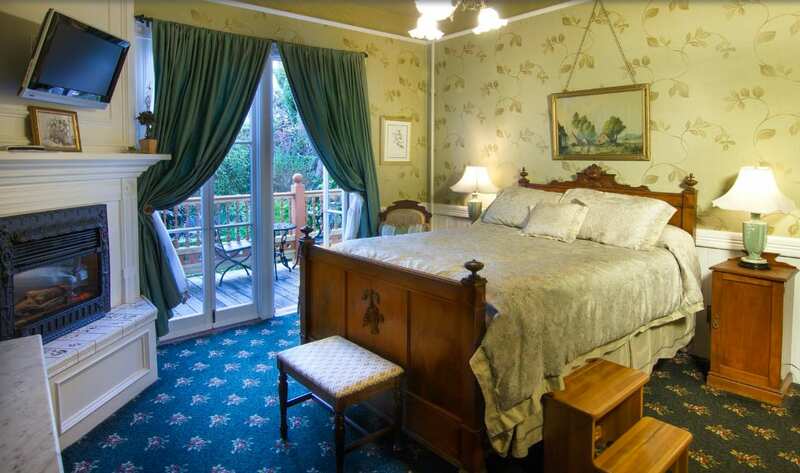 The inn offers 13 handsome guest rooms with high ceilings, original redwood trim, vintage fixtures, and elegant antiques. 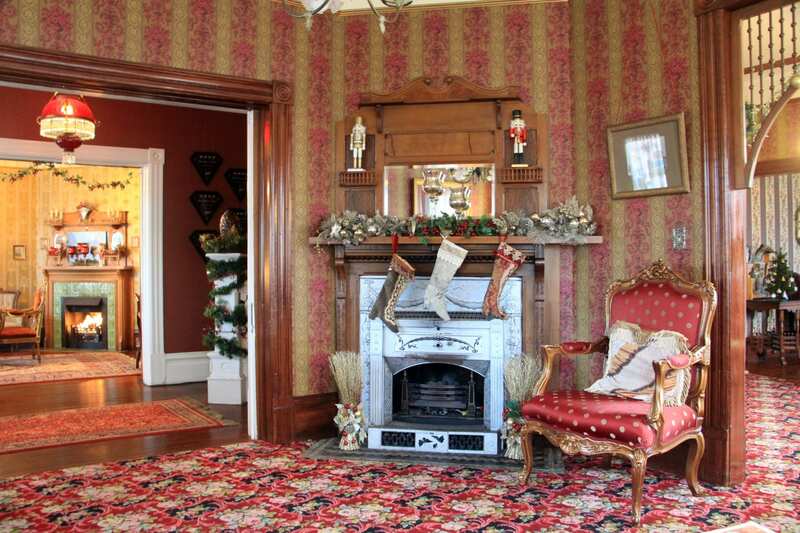 A number of the rooms also feature cozy fireplaces and large bay windows overlooking the town. The guest rooms are located on the second floor of the building and share a common space with seating areas, games, a kitchenette, and self-serve coffee, tea, and hot cocoa. 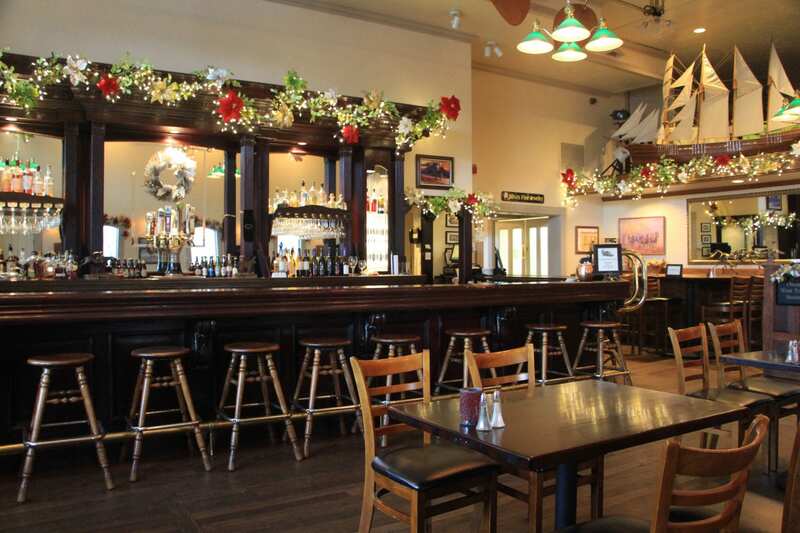 Downstairs, the inn houses a jewelry store, a tavern with an Old West-style bar, and VI Restaurant, which provides fine dining seven days a week. I stayed in room 202—the Maggie Russ room—which is a lofty room overlooking Main Street from a large bay window. A table and two chairs sit in the window’s alcove for enjoying the view. Decorated in a palette of pale pink and blue with lace curtains and a fireplace, the room has a romantic air. The brass king bed is covered in luxuriously smooth sheets. The private bath features a dressing area, pedestal sink, and a tiled shower with a rain shower head. A complimentary, made-to-order breakfast for two is included the stay, and is served downstairs in the VI Restaurant. Breakfast includes a choice of entrees, juices, and freshly-brewed coffee and tea. For lunch and dinner, the restaurant’s menu combines innovative California cuisine with classic comfort foods. 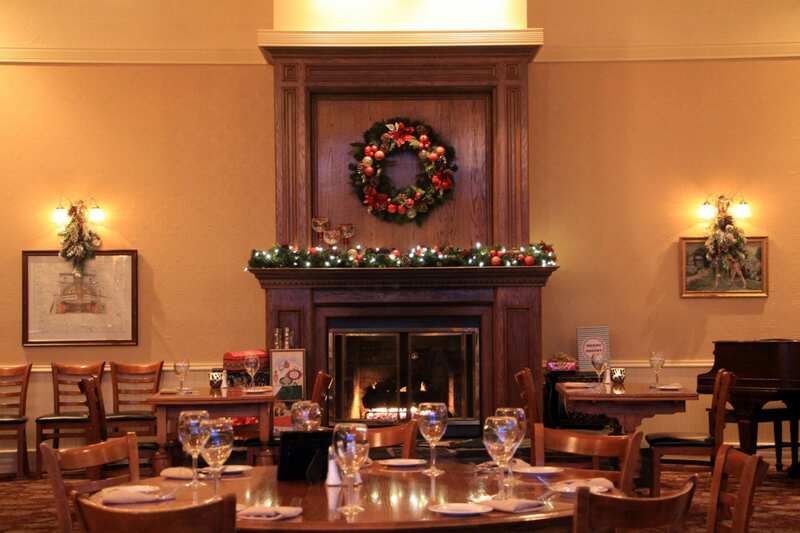 The inn hosts live music several nights a week in either the main dining room or the tavern. Over a delicious dinner of seared pork chops in a mushroom sauce, I had the opportunity to hear the talented local pianist Harry Smith play on a restored grand piano while a fire roared in the fireplace and Christmas lights twinkled on the tree. 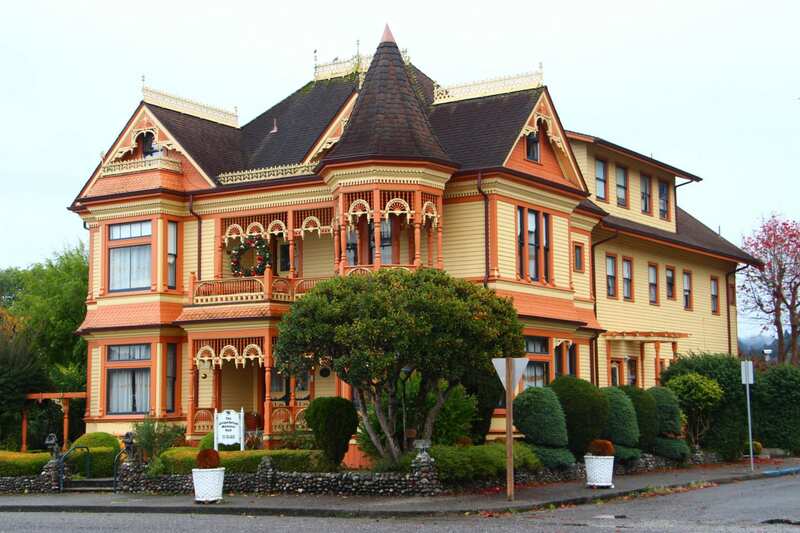 Just a block off Main Street, the AAA Four Diamond-rated Gingerbread Mansion Inn is a meticulously restored yellow and orange Victorian and one of the most photographed inns in Northern California. Its three opulent parlors are decorated to the nines for the season with lights, ornaments, garland, and holly. A Christmas tree stands in the front parlor windows while the fireplace glows in the corner and Bing Crosby croons over the radio. 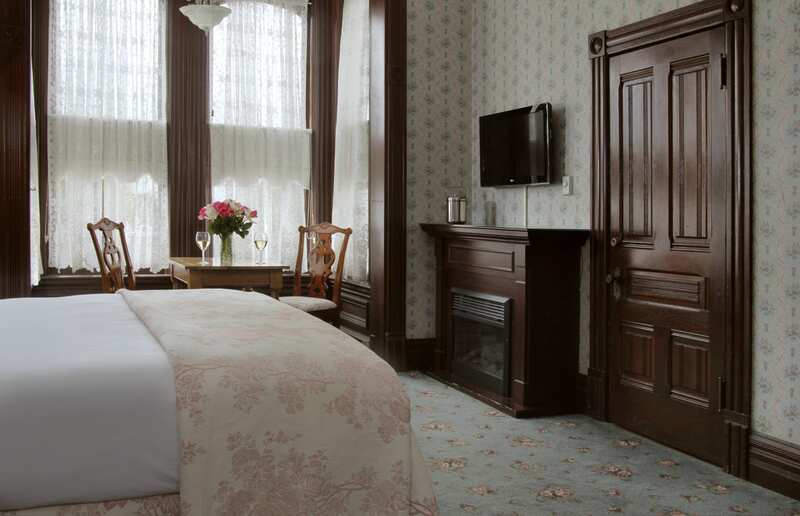 The mansion’s 11 lavish guest rooms evoke a bygone era with period wallpapers and antiques. Many of the rooms feature claw foot tubs and fireplaces. The glamorous Fountain Suite features twin claw foot tubs placed side-by-side in front of a mirrored wall next to a fireplace and a Victorian fainting couch. In another room, the Veneto, a claw foot tub is perched on a pedestal surrounded by hand painted murals reminiscent of Italy. I stayed in the Garden Room, which features a set of French doors that opens to a private balcony overlooking the English garden. The room is decorated in soft hues of sage green and gold. The queen bed is topped with a featherbed and a pile of pillows. 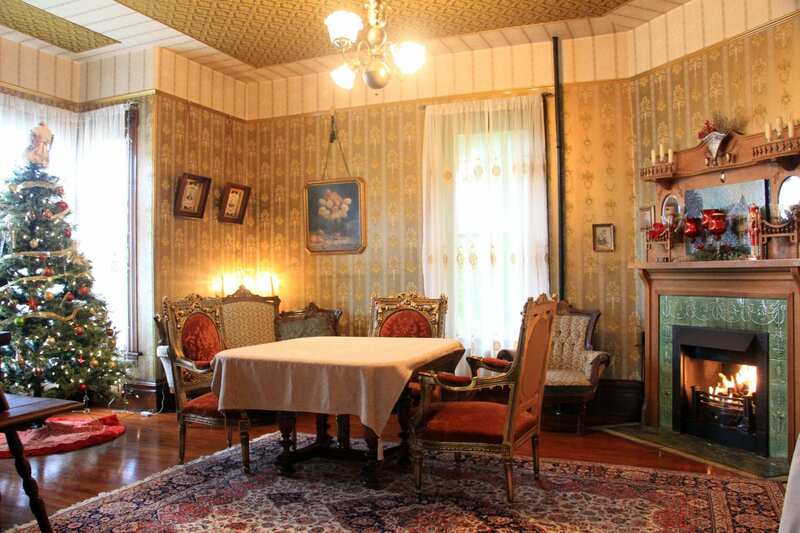 The room also features an antique dresser, beautifully upholstered antique chairs, and a corner fireplace. 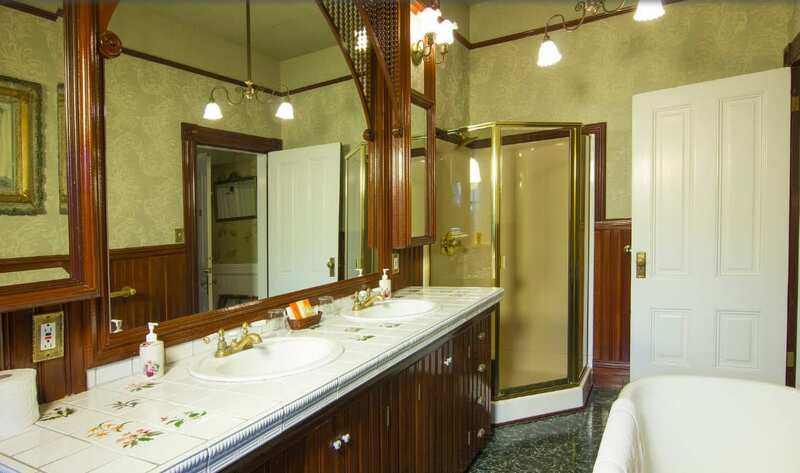 In the bath, intricate Victorian woodwork frames a mirror over the tiled vanity with two sinks. The bath also offers a claw foot tub and separate shower stall. In the afternoons, the inn serves complimentary tea and local wines with hors d’oeuvres and sweets from 4:30 to 6:00 p.m. Freshly baked cookies, coffee, and an assortment of teas are available all day. A complimentary gourmet breakfast is served in the dining room each morning and features a main entrée along with homemade pastries, fresh fruits and jams, orange juice, and freshly roasted coffee.